Whenever you try to install some new App on windows or want to run some software and you are getting some error for the same or the Windows crashes. At that time you have no idea what happen with app or windows. So it difficult for you to find the reason why your windows crashed. 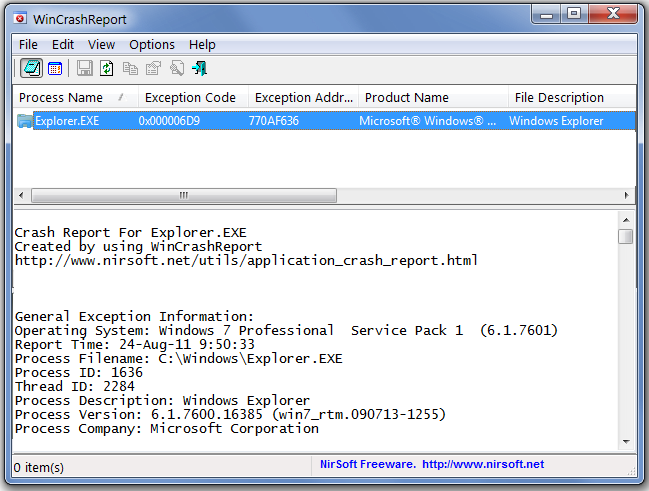 But with WinCrashReport freeware tool you can get extensive report about the crashed application. WinCrashReport is a small utility that provides an alternative to the built-in crash reporting program of Windows operating system. So next time when your windows crashes, just run the WinCrashReport app to view the detailed report regarding the cause for the crash. The crash report of WinCrashReport is displayed as simple text or in HTML, and includes the following information: Crash memory address, Exception code, Exception description, Strings found in the stack, call stack, processor registers, modules list, threads list, and more. WinCrashReport works on Windows XP, Windows Vista, Windows 7, Windows Server 2003 and Windows Server 2008. It’s totally free and portable app. So thats means no need to install the app on your pc, just run the exe file of WinCrashReport, and the crash report will be displayed in the lower pane of WinCrashReport.